New 3d neuronal labeling technique provides most comprehensive study of cortical circuitry to date. Researchers at the Max Planck Institute, VU University Amsterdam and Max Planck Florida Institute state that they have succeeded in reconstructing the neuronal networks that interconnect the elementary units of sensory cortex, cortical columns. The opensource study is published in the journal Cerebral Cortex. The team state that a key challenge in neuroscience research is identifying organizational principles of how the brain integrates sensory information from its environment to generate behaviour. One of the major determinants of these principles is the structural organization of the highly complex, interconnected networks of neurons in the brain. Now, the researchers have developed novel techniques to reconstruct anatomically-realistic 3D models of such neuronal networks in the rodent brain. The resultant model has now provided unprecedented insight into how neurons within and across the elementary functional units of the sensory cortex, cortical columns, are interconnected. The researchers found that, in contrast to the decade-long focus of describing neuronal pathways within a cortical column, the majority of the cortical circuitry interconnects neurons across cortical columns. Moreover, these ‘trans-columnar’ networks are not uniformly structured. Instead, ‘trans-columnar’ pathways follow multiple highly specialized principles, which for example mirror the layout of the sensory receptors at the periphery. Consequently, the researchers state that the concept of cortical columns, as the primary entity of cortical processing, can now be extended to the next level of organization, where groups of multiple, specifically interconnected cortical columns form ‘intracortical units’. The group suggest that these higher-order units are the primary cortical entity for integrating signals from multiple sensory receptors, for example to provide anticipatory information about future stimuli. The team explain that rodents are nocturnal animals that use facial whiskers as their primary sensory receptors to orient themselves in their environment. For example, to determine the position, size and texture of objects, they rhythmically move the whiskers back and forth, thereby exploring and touching objects within their immediate surroundings. Such tactile sensory information is then relayed from the periphery to the sensory cortex via whisker-specific neuronal pathways, where each individual whisker activates neurons located within a dedicated cortical column. The one-to-one correspondence between a facial whisker and a cortical column renders the rodent vibrissal system as an ideal model to investigate the structural and functional organization of cortical columns. The current study sheds light on the organization of cortical columns in the rodent brain through the systematic reconstruction of more than 150 individual neurons from all cell types of the somatosensory cortex’s vibrissal domain. This is the area of the cortex involved in interpreting sensory information from the rodent’s whiskers. In particular, the researchers combined neuronal labeling in the living animal, with custom-designed high-resolution 3D reconstruction technologies and integration of morphologies into an accurate model of the cortical circuitry. The resultant dataset can be regarded as the most comprehensive investigation of the cortical circuitry to date, and revealed surprising principles of cortex organization. The data findings show that neurons of all cell types projected the majority of their axon, the part of the neuron that transmits information to other neurons, far beyond the borders of the cortical column they were located in. Thus, information from a single whisker will spread into multiple cortical columns shows how axons of neurons located in one cortical column project to all surrounding columns . The results show that these trans-columnar pathways were not uniformly structured. Instead, each cell type showed specific and asymmetric axon projection patterns, for example interconnecting columns that represent whiskers with similar distance to the bottom of the snout. The researchers also showed that the observed principles of trans-columnar pathways could be advantageous, compared to any previously postulated cortex model, for encoding complex sensory information. Previous studies have evidenced for decades that cortical columns are connected horizontally to neighboring columns. However, because of the dominance of the columnar concept as the elementary functional unit of the cortex, and methodological limitations that prevented from reconstructing complete 3D neuron morphologies, previous descriptions of the cortical circuitry have largely focused on vertical pathways within an individual cortical column. The team state that the current study thus marks a major step forward to advance the understanding of the organizational principles of the neocortex and sets the stage for future studies that will provide extraordinary insight into how sensory information is represented, processed and encoded within the cortical circuitry. The researchers surmise that the novel approach of studying cortex organization can serve as a roadmap to reconstructing complete 3D circuit diagrams for other sensory systems and species, which will help to uncover generalizable, and thus fundamental aspects of brain circuitry and organization. 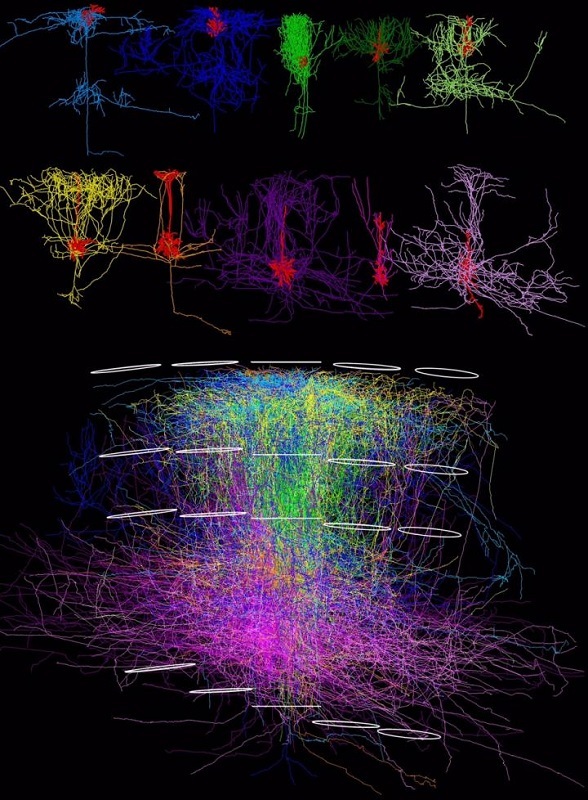 Top: Exemplary neuron reconstructions for each of the 10 major cell types of the vibrissal part of rat sensory cortex (dendrites, the part of a neuron that receives information from other neurons, are shown in red; axons are colored according to the respective cell type). Bottom: Superposition of all reconstructed axons (colored according to the respective cell type) located within a single cortical column (horizontal white lines in the center represent the edges of this column). The axons from all cell type project beyond the dimensions of the column, interconnecting multiple columns (white open circles) via highly specialized horizontal pathways. Credit: Max Planck Institute Biological Cybernetics, Max Planck Florida Institute for Neuroscience.